I miss seeing you around the office and I almost miss how you mispronounced my name. Actually, I totally miss that most of all. Anyways, I miss those days. When we worked on political buys and I got to know you. And you bought me lunch from restaurants that were a lot better than Arby's. You didn't always play by the rules but you knew what it took to get the job done. You didn't give a damn about "procedures", or "what NOT to ask in an interview." I have to say, I liked you from the day I met you, despite the illegal questions about my marital status. That day I almost quit? I didn't really mean it. After I talked to you, my heart was so full and raw, because I felt like you knew me. KNEW ME. Not completely, but more than most. You gave me the gift of belonging. 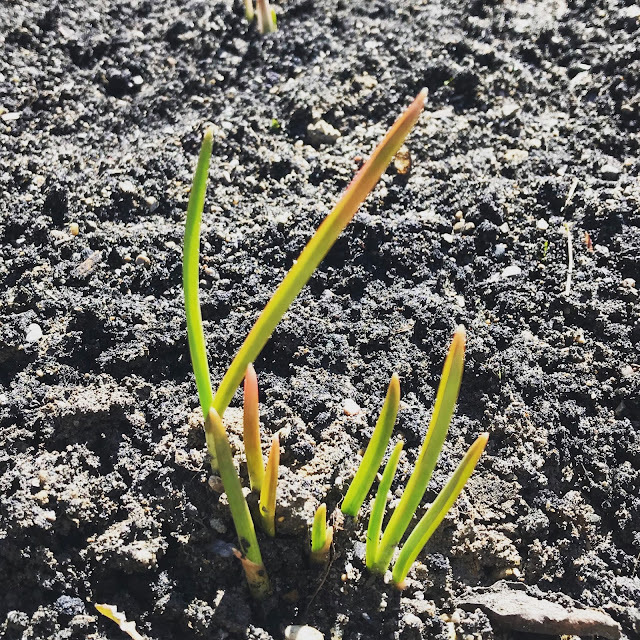 The other day, I was out in my garden and I saw my garlic finally grow into beautiful shoots and I thought of you. We had talked about growing garlic during one of our car trips to a client meeting, and your stance was that garlic is so cheap, what's the point? It made sense to me only slightly. Because I like garlic. And there's poetry in planting what you love. But I get it. And really, I get you.